SAN FRANCISCO, California, September 15, 2010 (ENS) – A federal judge has ordered 99¢ Only Stores to pay $409,490 in penalties for the sale of illegal unregistered and misbranded pesticides contained in household products. Imposed after two years of litigation, the fine is the largest contested penalty ever ordered by an EPA administrative law judge against a product retailer under the Federal Insecticide, Fungicide, and Rodenticide Act. The case against 99¢ Only Stores concerned the sale of three cleaning and pest control products. Out of a total of 166 violations, 164 involved the sale of a household cleaner called “Bref Limpieza y Disinfeccion Total con Densicloro” [Bref Complete Cleaning and Disinfection with Densicloro®], which was not registered with EPA, despite pesticidal claims on the label. The product was imported from Mexico and made statements in Spanish that it disinfects or sanitizes surfaces. The third product, PiC BORIC ACID Roach Killer III, was misbranded because EPA approved labels were upside-down or inside-out, making them hard to read. “All pesticide distributors-discounters and high-end retailers alike must comply with the law. This company’s disregard for state and federal law in its business practices has led to a penalty that reflects the seriousness of the violations,” said Jared Blumenfeld, EPA’s regional administrator for the Pacific Southwest. FIFRA is a federal law that regulates the sale, distribution, and use of pesticides. Before selling a pesticide in the United States, companies must register it with the EPA. Each producer, seller and distributor must also ensure that the registered pesticide is labeled according to agency requirements. In its original case, brought in September 2008, the EPA proposed an aggregate penalty in the amount of $969,930 for these violations. “Consumers who bring cleaning products into their homes expect them to be safe and effective, with clear labeling that gives them the facts,” said Kathy Taylor, associate director of the Communities and Ecosystems Division in the EPA’s regional office. “This penalty should send a deterrent message to retailers that they must comply with the law regulating pesticides,” she said. Inspectors determined that 99¢ Only Stores illegally sold at least 658 bottles of the “Bref” product at stores in California, Arizona and Nevada. The violations were first discovered in 2004 during an inspection by the California Department of Pesticide Regulation and confirmed during multiple inspections in three states from 2004 to 2008. 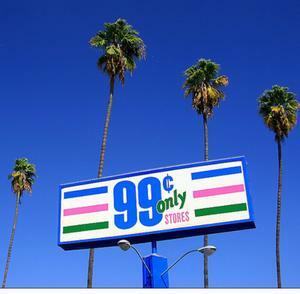 The 99¢ Only Stores is a quarter-century old publicly-held corporation based in City of Commerce, California. In its 2008 Annual Report, the company said it operated 273 retail stores in California, Texas, Arizona and Nevada, with annual net sales of $1.2 billion, an annual net income of $2.9 million, and $650 million in total assets.